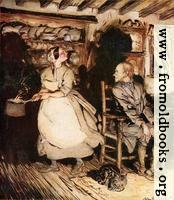 Images and text from Some British Ballads illustrated by Arthur Rackham. 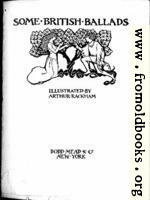 No credit is given for whoever might have edited the collection; the ballads appear to be reprinted with minor changes (possibly errors) from Francis James Child’s The English and Scottish Popular Ballads, and indeed the book acknowledges that permission was given to do that. I bought my copy from Olivier’s Booksop in Picton, Ontario, in May 2006. 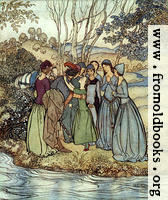 Arthur Rackham, the famous illustrator of children’s books, died in 1939, more than 50 years ago, making the images out of copyright here in Canada; the book was published in the USA prior to 1922, and hence is in the public domain in the USA. Published by: Dodd, Mead & Co.
Out of copyright (called public domain in the USA), hence royalty-free for all purposes usage credit requested, or as marked. Note: If you got here from a search engine and don’t see what you were looking for, it might have moved onto a different page within this gallery.